Rarely has a meeting between two politicians of the same party generated so much media excitement. The streets of this part of southern California have been clogged with TV satellite trucks and curious onlookers and a near army-sized deployment of secret service agents to stop us all getting too close. The excitement was understandable. It was after all the meeting of arguably the country's two most powerful politicians, the president and the soon-to-be governor of America's most populous and vote-rich state. 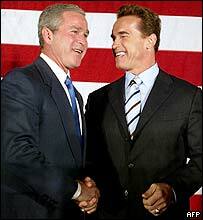 But this was not the first meeting for George W Bush and Arnold Schwarzenegger. White House officials informed us they had met before, but did not know each other well. Apparently, in his Terminator days, Mr Schwarzenegger had campaigned for the president's father - himself once a president, of course. So how did it all go? Well first of all, here are the practical details. White House officials say the two men met for 30 minutes alone in the president's hotel before taking a 15-minute limo ride together to a campaign fundraiser for the president. As for substance, where the briefings always get a little sketchier, the verdict was that the two men had "a very good visit" and had "gotten to know each other". We were also told "they shared priorities on a number of issues". There was even a little appeal from the actor-turned-governor for any useful advice from the president on how to run a big state - remember Mr Bush was himself a former governor of Texas. The public part of their get-together was much more fun. Speaking at the fundraiser in his heavily accented English, Mr Schwarzenegger said he could "nefer hef imagined he vould" one day be introducing the president of the United States. The president seemed decidedly surprised too, but pleased to have a new star in his Republican Party. With the ex-Terminator standing by his side, the president joked they had much in common - they had both married well, some said both had trouble speaking English and both had big biceps. The president then cracked that two out of three was not bad. Of course both men are eager for help from each other. Arnold Schwarzenegger would like some cash from the president, or to be more precise the federal government, to help fix the giant financial crisis California finds itself in. For his part, the president would no doubt love the Hollywood star to deliver the normally Democrat-voting California in next year's presidential election. Neither will be easy to grant. But that is all in the future. Today it was all about the F word. President Bush said he was proud to call Arnold Schwarzenegger friend, the governor-elect went one better calling the president his dear friend.